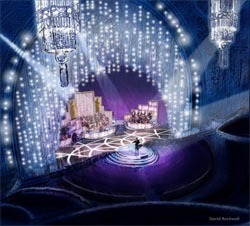 That backdrop of shimmering Swarovski crystals at this year's Academy Awards could never have happened as easily if not for Lexco Cable. The provider of custom cable supplied five miles of its premium cable to support the 92,000 Austrian crystals that comprised the 100-foot wide by 60-foot tall display. The assemblage was handmade by Orion of Rhode Island and weighed in at a whopping three tons! Says Howard Turco of Orion: "I'd like to thank Lexco for all of its help. The1/32" cable Lexco supplied worked out well to hold all that crystal! (All 22,000 feet of it.) We've used other cable before and paid much more for less quality. The flexibility of Lexco's cable made our job much easier. Thanks Again." "It's not everyday that you get to be a part of something that is seen by a worldwide audience," say Neal Karbin of Lexco Cable. "We only found out the Friday before the Oscars that the stainless cable we had provided would be used for the crystal curtain at the Academy Awards. During the order process, we only discussed breaking strength requirements and the working load."